FakeMaker is updated with support for unit testing Episerver Commerce code. I am very excited about this and hope it will be useful in your projects. The new version is made with contributions and feedback by users of FakeMaker. Thank you! Install the new plugin to FakeMaker - called FakeMaker.Commerce - from NuGet, or check out the source code on GitHub. The package currently suppport basic unit testing scenarios. What kind of features are missing? Contact me by creating a GitHub issue, sending a pull request or just write a comment on this blog. FakeMaker takes care of mocking and a simplifies creating fake content, that you can use when testing your code. Unit testing the EPiServer CMS got a whole lot easier alredy with version 7. However, creating fake content to be used when setting up mocked repositories isn't always that smooth. When mocking of code is all you see on your screen, this little library may help. A bigger screen probably also would, but is probably more expensive. FakeMaker make it easier to write unit tests for mvc controllers and helpers that expect the episerver repositories to return content. And now also for creating fake Commerce content. How does the Commerce support work? Add pages and products to the repository and you are ready to go. In the beginning there was the Pyramids. Okay, that was not exactly true. We actually had Ajax before that. With ajax, we also got callbacks. Some of the mighty callback pyramids were built and are still standing. What if the ajax library at some point would ... go crazy? The promise will be resolved only once, even if the ajax library goes bananas. This reminds me of when I was on the bus with the kids a couple of days ago. The little one wanted to press the shiny "bus-will-stop" button. When we got closer to our stop, the kid pressed the button and got the expected feedback (a "bus-will-stop" signal!). That was fun! So, he pressed the button again. But nothing happened. Naturally, he tried a couple of times more. Nothing happened. Just like the "bus-will-stop" button, a promise is resolved only once. I think the bus driver (and passengers) appreciate the feature. Of course, the code above won't work. I will try again, by using some of the magic of generators. A generator enable pause and continue functionality to a function. You can jump back and forth between a generator and the consumer code. That code won't work out of the box either. We need some help from a library. This library (the run function) will help us go back and forth between the generator and the consumer code, and resolve promises. Okay, cool. It looks nice and sequential, at least when focusing on the rows within the function. But wait. Will people understand code with funky star functions and weird libraries? There has to be another way. I think the upcoming ECMAScript async & await feature can help us write easy to understand sequential code, without funky star functions or weird libraries. With this, I think it actually is possible to use the words "readable" and "async" in the same sentence. Behind the scene, the async & await feature is a combination of Promises and Generators. I think the future of async programming looks very promising. Maybe we don't have to wait for it either. The transpiler Babel has already support for async & await today. Perhaps it is time to go back to the future? I have updated FakeMaker (helping you unit test your Episerver code) to support the version 9 binaries. Breaking changes caused compile errors (oops!) and made the tool incompatible with the latest versions of Episerver. It turns out that the base library context no longer has to be mocked, and that's a good thing! The solution was simple: delete code. I love deleting code, maybe even more than writing code. FakeMaker may help you delete your code. When writing unit tests, creating fake content and mocked repositories can be a bit depressing. When mocked code is all you see on your screen, this little library may help. A bigger screen probably also would, but is probably more expensive (and won't cure depression). The latest version is available for download on NuGet, and the source code is on GitHub. Both are targeting version 9.6.1 of the Episerver Core libraries. If you need Episerver 8 support, download an earlier version from NuGet, or clone the GitHub repo and checkout the epi-8-support branch. Please let me know if you have feature requests or run into any issues. you are about to write code that uses the episerver page tree to find pages of a certain type, children of a root node, or maybe just the start page. FakeMaker makes easier to write unit tests for code like that, by creating an in memory page tree and add it to a fake content repository. You will find more examples at the FakeMaker GitHub repo. Windows? No, I'm a .NET developer. A couple of days ago, I talked about and coded some of the new ASP.NET Core 1.0 things at the Swetugg 2016 conference in Stockholm. I used my Ubuntu laptop, the one I write code on every day at work (also used for occasional night coding at home, when the kids are sleeping). "Well, some of us use editors like Sublime or Vim, some use an IDE like PyCharm. Most of us have macbooks, but a couple of team members have various Linux distros installed on their computers. It doesn't matter. You'll be fine as long as you can run the 'make' command. What stuff do you use?" Remember this movie scene? That was me. I have never, ever, in my life as a software developer heard that question before! .NET development usually equals Windows and (often a specific version of) Visual Studio, at least from my experience. 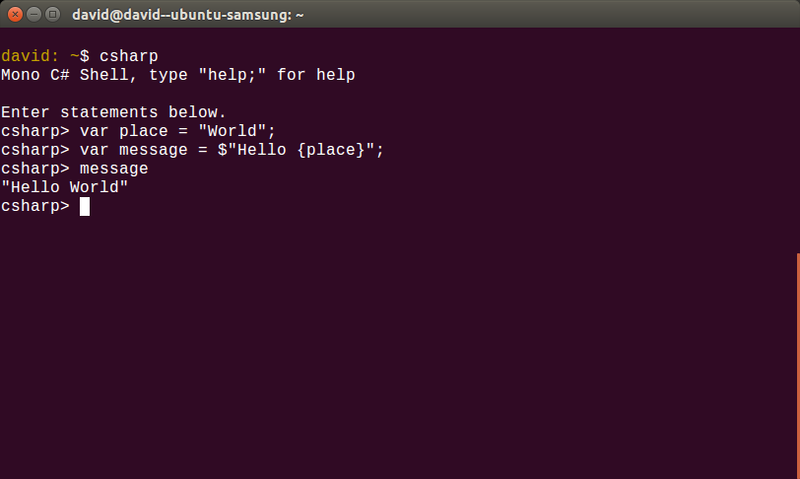 On my first day at work I was very excited to use Ubuntu, code in PyCharm and write strange terminal commands. Today, a couple of months later, the terminal has become my new best friend. Ubuntu is fast, responsive and doesn't get in my way. Well, sometimes a bit tricky to use when native apps are missing, but that's fine. It feels like I'm on a diet. It would be great if we, the .NET people, also were able to freely choose our favourite tools, editors and even operating system. Because it's fun! We shouldn't underestimate the value of fun. If the tools we use are platform independent, we can be platform independent as developers too. That will bring us closer to other dev communities. Chances are we will learn (and share) more than when staying in isolation. Being a platform independent developer is a good thing. In fact, .NET developers can do all of that now. 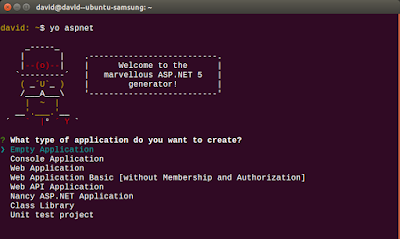 I have been following the development of ASP.NET 5 (recently renamed to ASP.NET Core 1.0) from the early beta versions, and started experimenting with it on my Ubuntu Linux machine a couple of months ago. This is my current setup: write C# code in Atom, push commits to GitHub, trigger builds and publish to Azure Web Apps when pull requests are merged. Developing on a Linux dev machine and publishing to a cloud based Windows machine. Atom, really? I know, Visual Studio is hard to compete with, especially when used together with ReSharper. But editors like Atom are lightweight. I like that. They are not only lightweight, they also have the possibility to install plugins like OmniSharp. OmniSharp add editor features close to the ReSharper experience. Once learned, it is so simple. Let's stay in the command line window, because there is another essential tool for platform independent .NET development: Yeoman. With Yeoman, we get the command line version of "File -> new project". You can also install Yeoman as a plugin to Atom. I usually create a new C# project from the command line and later add files using the Atom plugin. I haven't figured out how to exclusively use the new modular CoreCLR on my Linux machine. I can't get it to work without selecting the Mono version in the .NET version manager (the dnvm command). I guess it will be fixed soon, but it doesn't really matter if you want to get started now. 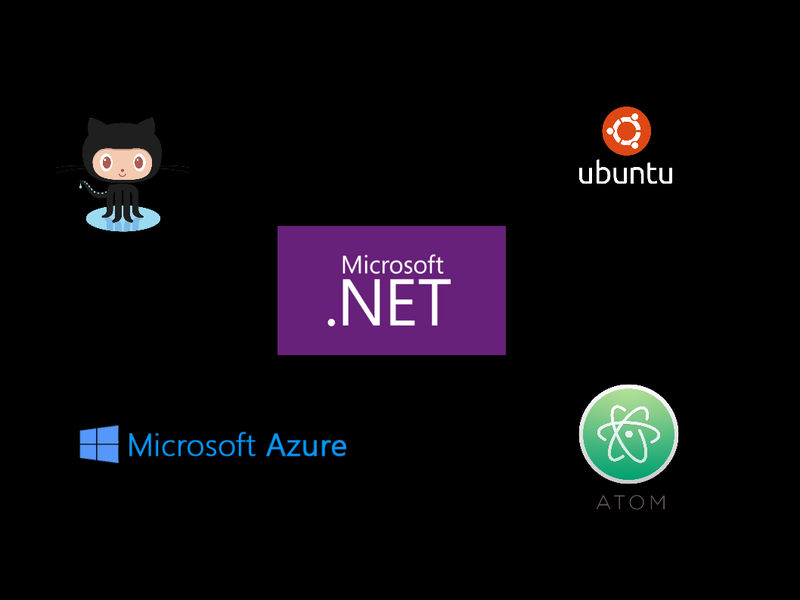 Mono is the platform independent version of the system wide installed .NET Framework on your Windows machine. Besides that, Mono comes with a great tool: the REPL. Great for experimenting and learning about new cool C# features. 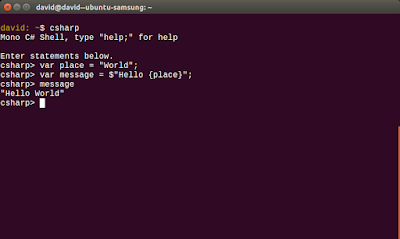 Just type the word csharp in the terminal and start experimenting & learning. 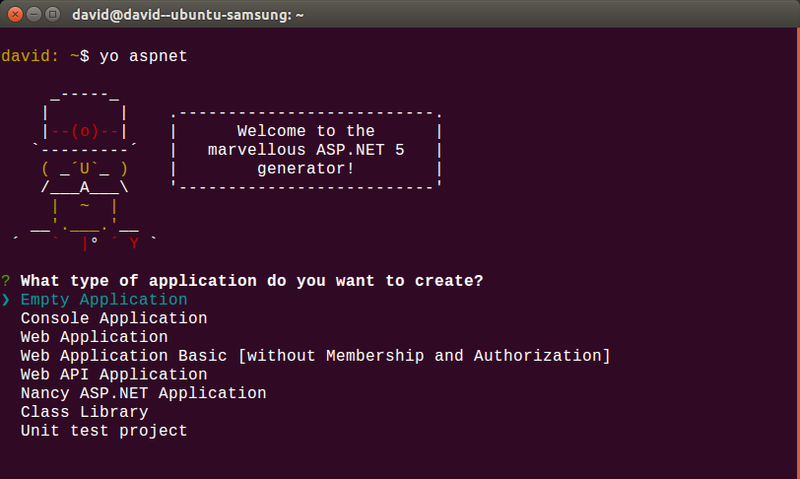 So far, the .NET development on Linux experience has been very nice.